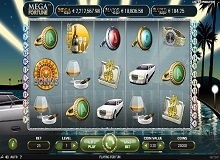 Experience a life of Riches and Luxury by playing Mega Fortune slot machine. This is a lavish slot machine by NetEnt developers which makes your dream for a fantastic lifestyle true. This game is decorated with extravagant symbols. It is among the largest progressive jackpot slot online. The maximum payout ever recorded is €17.8 million which a player won in 2013. The jackpot winner increased good publicity of the 25 paylines and 5 reels casino online game. Since it is a progressive game, the price increases as people continue to play. Enjoy this fantastic and rewarding slot on any device powered by Android, iOS, Mac, Linux, and Windows. To get this luxury life, you need to start somewhere. The only way to bet for the jackpot is to play Mega Fortune for real money. Set the reels to wager on and the value of the coin to bet. Then choose the amount to bet with per line and press the Spin button. The jackpot amounts will be shown above the reels while the amount of bets is listed at the bottom of the screen. There is an advanced autoplay feature where one can play from 10 to 1000 spins automatically. The spins will only stop when a bonus game or free spins round is activated. You can also set for the reels to stop when your losses or earnings reach a given limit. The coins in the slot are worth between €0.01 and €0.50. The slot has 4 bet levels, and thus the player can bet with one to four coins. The stake per spin ranges from €0.01 to €50.00. 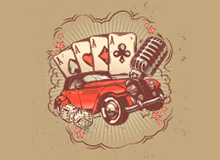 The maximum amount of money offered to a player during the free spins is €107,000. Mega Fortune slot has super rich symbols on the reels. They are all related to a lavish lifestyle. The background is made of a bottle of champagne, fast cars, and yachts. The slots icons are limos, golden ring, money clips, an expensive watch and stacks of cash. Lower value icons A, K, Q, and J are engraved onto rings with different colours. It has a high RTP of 96.6%. A Speedboat- This icon plays the role of a wild. The speedboat replaces all other icons on a winning combination in exception of the bonus and scatter symbols. Five wild icons on an active bet line pay 10,000 coins. The wild comes along with x5 multiplier. Champagne – The icon represents a scatter symbol. The champagne icon with some glasses activates the bonus round. When you manage to have 5 champagne icons anywhere on the screen, you will receive 100 coins. Wheel of Fortune- This wheel acts as the bonus symbol. This icon unlocks the bonus game. The bonus icon is also the key to winning a progressive jackpot which makes it interesting to play Mega Fortune casino slot online. Wheel of Fortune Bonus GameTo activate this bonus game, the player needs to line up three or more wheel of fortune bonus icons on a successive payline starting from left to right. The wheel will start to spin, and one is either shown an arrow to the inner wheel or given a cash reward. If you get to the inner wheel, it will spin and again you will either be awarded a rapid progressive jackpot or directed to another inner wheel. The next wheel spins and rewards the player a major progressive jackpot, or they will be directed to the innermost wheel with the Mega progressive jackpot. Free SpinsThe player enters the free spins bonus round when they get a minimum of three champagne icons anywhere on the reels. Five, four or three champagne symbols awards 20, 15 and 10 free spins. 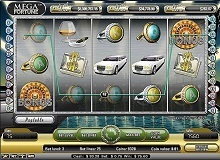 Five or more scatter icons on the screen awards you a multiplier on top of the free spins. Progressive JackpotThe Mega Fortune game features three progressive jackpots. There is a rapid, major and mega progressive jackpot. The bonus game gets you closer to winning one of the jackpots. The Mega jackpot starts from €250,000. The slot’s gameplay is smooth, and it never lags irrespective of the device you use to play. Familiarize yourself with the game by playing free Mega fortune before you load your account. This will assist you to get a strategy to hit the wins and improve your gaming experience. The medium volatile game provides small payouts regularly to keep the gamer entertained endlessly.